It’s not hard to see why they call this park the heart of the city. Set by the sea, it is a five kilometre long celebration of nature. 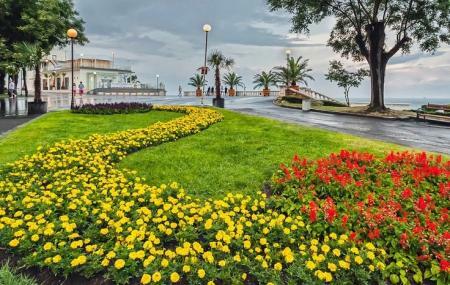 It was established in 1910 Georgi Duhtev, who saw a great desolate patch of land between the city and the sea and thought to turn it into a botanical garden. He brought hundreds of pieces of exotic plants to the city; today, this older side of the park has been declared a monument. Scattered about the park are sculptures and busts of notable people in the city’s history, the most famous of which is that of Alexander Pushkin. There are several fountains, an open air theatre called the Snail, the Plazza Dance Centre, the Sea Casino and a small zoo. A number of pubs run along the promenade. In front of the park, stretching out into the water, you’ll find a thin pier. You may walk to its end. Several important events are organised at the park every year. The Flora Burgas is an annual international flower show that’s held at the Garden. Others events include the “Burgas and the Sea” Popular Song Contest, the International Folklore Festival, “Spirit of Burgas” Music Festival, and “Turn on the City” Contemporary Art Festival. Prikazkite: BGN 2-3 for each ride. How popular is Sea Garden? People normally club together Ravadinovo Castle and Natural History Museum while planning their visit to Sea Garden. Beautiful, clean, gorgeous. We were with our dog, she liked it too. All dogs should be on a leash, but there is a big area with fence for the dogs to be walked freely. It is not the mat appropriate time to see Burgas Sea garden during the winter, but still it was beautiful and and ornamented for the coming Christmas. I liked all the light effects in it, also very much the ones on the peer. A good place for relaxing in Burgas. There are restaurants that work even in the winter. The alley is clean and suitable for biking and jogging. The view is really beautiful and in the season there are many tourists. The surrounding beach is not the best option however. This is an amazing park in Burgas. It is huge and by the sea. Amazing views and an excellent place for nice walks during warm summer evenings. There are numerous surprises in it and it is very beautiful. It also has paid parking very near, so easily accessible by car too. One of the loveliest parks I have ever visited.